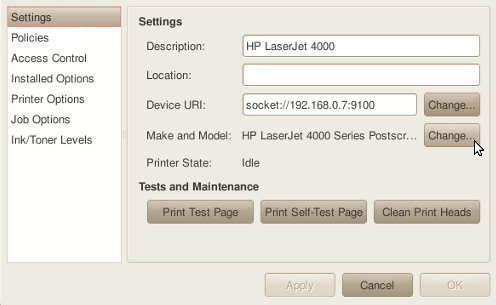 The HP LaserJet 4000 is an ancient, 17 pages per minute monochrome laser printer that has served me for many years and that you can pick up very, very cheaply today (or free, from all good dumpsters). It also works perfectly almost out of the box with Ubuntu, and even better with a couple of cheap upgrades. I'd have a picture at the top of thise page of mine, like I do everything else but it's so old and crusty that I'm sure you don't want to see a picture of it. Nope, you really don't. The JetDirect card. From standard, the 4000 only had a parallel port, which modern computers don't have. Don't mess around with USB-to-parallel adapters, and pick yourself up a JetDirect network card for next to nothing. It'll give you networking capability and will be much, much faster than trying to get it working via the parallel port. You want either the J3110A or J3111A; the J3112A doesn't work on modern Ethernet networks. These cards are less than £10 shipped, from eBay, which is so cheap that I'm not even going to bother with instructions for getting the 4000 working through a parallel port with Ubuntu. More memory. The standard 4mb is not enough for some pages you will be printing out (you'll know when you get an insufficient memory warning). The part numbers you'll want are listed on page 7 (PDF page 19) of the manual, linked below. These are also less than £10 shipped, and the 4000 can take three of them if you really need it. From here, I'll be assuming you've done the above. Hey, it's £20: go do it. Short version: use the hpijs driver. Easy step-by-step instructions follow. I had all sorts of problems with the PostScript driver, particularly long delays in loading the standard GTK+ print dialog. There were also jobs seemingly disappearing: being sent to the printer, which would display PROCESSING JOB for a few minutes and then go back to READY without ever printing the job. Using the hpijs driver fixes this. Note: these instructions are for Ubuntu 10.04. If you've not added additional memory, you want to set this to 4-7mb, unless you've got the 4000TN variant, in which case you want to set it to 8-11mb. If you have added memory to it, you want to add the memory card's capacity to the internal (4mb) memory; specify 12mb if you've got an 8mb card, for example. If you don't know what the other settings should be, leave them at their defaults. Hit "Forward" again, then "Apply" in the next dialog box. Print a test page if you want to. Huzzah! 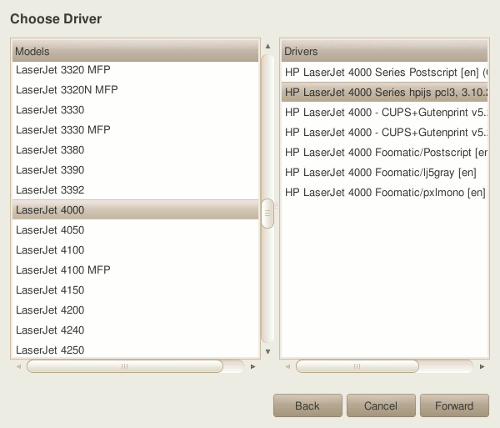 You're now using the hpijs driver. Oh no, it doesn't work! 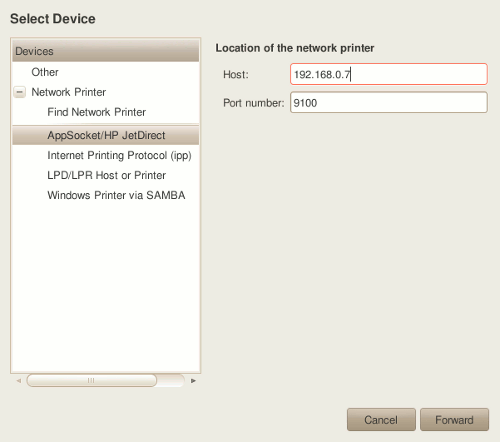 Make sure your router isn't automatically assigning the IP you've given your printer to another computer on your network. My Netgear DG834 router does this from time to time. Manually assign that machine a different IP address if needs be. Power-cycling your router might fix it, too. I'm not singling out Epson; they're the same as all the other manufacturers. When they say "up to 30 pages a minute", they're probably talking about the printer's feed motor speed, and unless you're printing a single line of text on each page there is no way you are ever going to get 30 pages a minute out of one. Not happening. I've used one, and I don't mind telling you that in the real world you might get half that, at draft quality, and half that again for non-atrocious print quality, and even then it doesn't look as good as the ancient LaserJet does. With the 4000, 19 pages per minute means 19 pages per minute. There are inkjets that can do 30 ppm, but you're not going to be paying £60 for one. By the way, did you know one of those will cost you 10p per page (probably using some fudged figure just like their PPM rating)? Look around and you'll find LaserJet 4000 toner cartridges for about £30, which at their rated 6000 pages, is going to be about 0.5 pence a sheet, or twenty times cheaper. I got my printer used with a part-used toner cartridge, and despite printing Goodness-knows-how-much stuff I haven't needed to replace the toner cartridge in the 5 or 6 years I've had it. Hooray! Inkjets are cheap, just as "Rottweiler puppy, free to good home" is actually free. On the other hand, the SX215 works great as a cheap photocopier, so don't mind me. HP have the manual over here (look on the left-hand navigation under "Manuals"). It doesn't have any Linux information, but it does have some useful general information.